Who knew that using a stick to get in shape could be so much fun and so effective at helping you reach your fitness goals? Yet fun is exactly the idea behind the Xtend Barre Stick program, a fast-paced workout that utilises a Pilates Stick (a dowel-type apparatus with a spring- based resistance) attached to a ballet bar to add resistance and condition the body. An extension of the Xtend Barre classes, Xtend Barre Stick similarly fuses the principles of traditional ballet with Pilates and combines isometric exercises and orthopedic stretches together with weight training to sculpt your body and condition your core. It is guaranteed to work your body in ways that remind you why you are working out in the first place. Comprising a cardio warm-up, an upper-body segment, lower-body segment, and abdominal focus, the workout chisels every part of the body. With the added spring-based resistance from the Pilates stick, the Xtend Barre Stick Class challenges you to further train your core stability, develop upper body strength, and build endurance. Like all of Upside Motions offerings such as Xtend Barre, Pilates, and Aerial, Xtend Barre Stick is a non-gender specific workout that is designed to not only improve your physique but allow your mind and spirit to be rejuvenated. 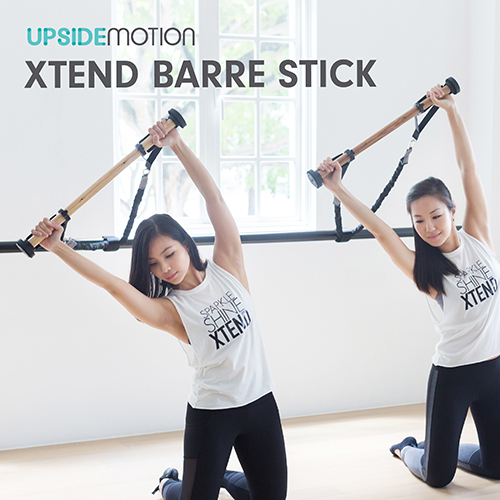 The new Xtend Barre Stick classes are available at Upside Motion from December. Visit our class schedule to book your slot!